Especially designed for your 2016/2017 MacBook Pro including 13" and 15" models, the Cateck Type-C Aluminum Pro Hub Adapter is the newest addition to our USB Type-C collection, to simply upgrade your Type-C port to a Thunderbolt 3 port, 4k HDMI, USB-C port, 2 USB 3.0 ports, and SD/Micro SD card reader. The aluminum construction can perfectly match your Apple computers and accessories. And the elegant Type-C Pro Hub Adapter is available in Space Gray, Silver for you. 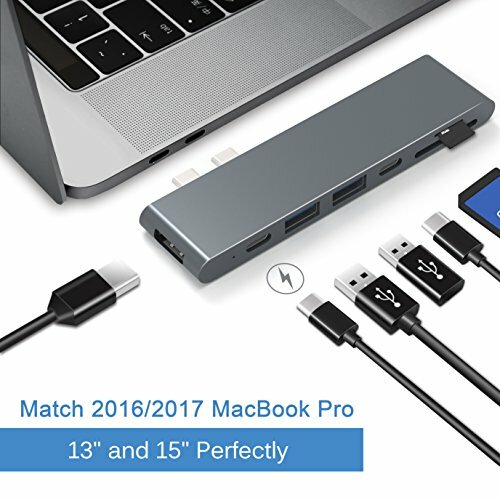 Added Thunderbolt 3 port supports data transfer of speeds up to 40Gbps and pass through charging for both 13" (61W) and 15" (87W) MacBook Pro models. Use the HDMI port to output crisp, high-resolution video to your 4k monitor screens. Simply connect an HDMI cable from the Pro Hub Adapter to your external monitor to view crystal-clear display. Don't worry, your everyday ports are still here. Utilize the USB-C port and 2 USB 3.0 ports for extra data transfer and SD/ Micro SD card reader for video and photo editing - on the go.